The KeyLines API Reference features over a hundred functions, objects and events. While this gives you ultimate flexibility to build tools, it’s easy to overlook useful functions in such a comprehensive library. Let’s look at a few of KeyLines’ lesser-used functions that you might have missed. Enjoy! Visualizing networks can lead users to uncover connections that were previously unknown. For example, an investigator visualizing a fraud ring might be looking for connections between people. They can only understand those connections when they look at a broader network of attributes, like addresses or vehicles. 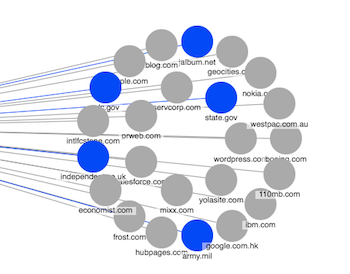 In scenarios like these, createLink lets end users draw new links in their chart. To download the full source code, go to the Add Items demo on the SDK site. But what many developers don’t realise is that if you specify that useRegEx = true, passed IDs are treated as regular expressions. A department name, such as “Admin”, “Sales”, etc. If you think carefully about your ID strategy, you can use this as a powerful way to help users navigate their networks. One of the many advantages of KeyLines charts is that they’re highly interactive. But what if you need to stop your users from interacting with them? That’s where chart.lock comes in. For example, you might lock your chart while new data loads from your database. There will always be a slight delay as KeyLines waits for a response, and you may prefer to block user actions during this time. Deactivating your chart for the few seconds it takes to load helps users stay in control of their progress, and reduces the likelihood of errors. The chart.serialize function returns a complete serialization of the current chart format. Together with chart.load, it lets you build features that let your users save, load and share charts, as well as undo and redo. A handy use of chart.serialize is to create undo/redo stacks, as we showcase in our our Add Undo/Redo demo. All we’re doing here is serializing the chart state after a user action, and adding it to an unlimited stack. It’s a convenient, and reassuring, addition for users. We’ve written about this function before, but would love to see more of you using it. 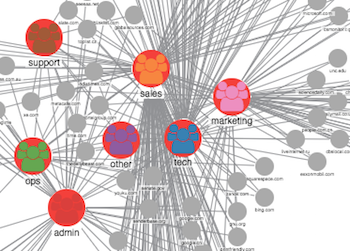 As the name suggests, graph.clusters help identify clusters, or communities, in your network. It does this by calculating which partitions give the lowest modularity score. Value - assigns links a weighted value, which affects the modularity score, and therefore cluster size. Factor - a number between 0-10 that defines how large your clusters should be. Consistent - set to true for the same clusters each time you run the function, or false for different results each time. All - lets you decide whether to run clusters on all nodes, including hidden ones. The best place to see clusters in action is our Use Clusters demo. In includes helpful UX ideas, like sliders and using colors to differentiate clusters. I hope this post has given you some ideas for improving your KeyLines applications! If you’re not already a KeyLines developer, why not give it a try? Register for a free evaluation account of the KeyLines SDK.